Top Seller! Powerful electronics package transmits intense energy into your target, overwhelming them with pain. 20,000,000 volt Rechargeable Runt with built-in Recharger, flashlight, and wrist strap disable pin. This is a newly designed unit that over delivers on power and is more ergonomically correct to hold in your hand. The solid and thick prongs on the top are built to withstand the immense electrical charge and to fully emit all the power it is capable of without loss through resistance. Retractable plug hides away (slides back) after you charge the stun gun. Standard charge time is 6-8 hours but no more than 8 hours. You charge it overnight and it's ready for you in the morning. You only have to charge it about once every 2-3 months depending on use. If you don't discharge it, it'll last that long. Of course the more you use it, the sooner you'll need to give it more juice. Rechargeable means never needs batteries. 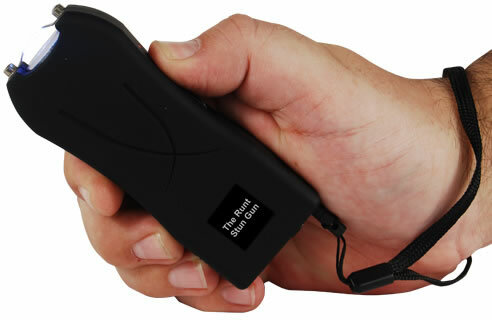 The Runt Rechargeable Stun Gun will fire 300-500 times on a full charge. 8-hour initial charge. Test fire monthly. Lifetime warranty. This mini stun gun is easily hidden and fits nicely on your belt with the included holster or inside your purse or handbag for quick and easy access. Comfortable carry in the hands of a man or a woman. NOW AVAILABLE IN BLACK, PINK, PURPLE, BLUE, GREEN, and RED! Runt Holster in Leatherette available. When your life or property is in danger, most of the time you really have no other recourse than to fight back. But for many, physical strength can only do so much and go so far, which is why there are numerous options for self- defense weapons. One of these is the Runt stun gun, a device that's small enough to fit in a purse or a pocket but offers enough power to help prevent an attack and save your life. The Runt is a product of Stun Master, a brand specializing in self defense gadgets that deliver an electric shock when triggered or applied. It's a small device measuring just 4 ¼” x 1 5/8” x 1”. It provides one of the highest power ratings of these types of defensive tools at 20,000,000 volts. The high output is meant to optimize the stun gun's use during an emergency situation and more than makes up for its small size. The stun gun is often mistaken for a Taser. While their basic use is similar (they both deliver an electric shock to the target), they differ in the way they are used and how they function. A Taser uses a wire and barbs to penetrate the target to deliver the electric shock. The wire through which electricity travels is connected to a triggering device that is held in your hand and can be up to 15 feet away. 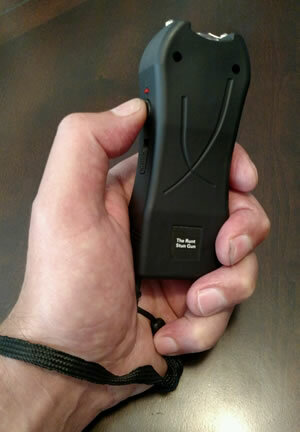 A stun gun delivers a shock upon direct physical contact with the tip of the gun. This device works well for close contact encounters and can be advantageous when an attacker is at arm's length. Unlike the Taser, the Runt does not require careful aiming since it will deliver a shock regardless of the area that the tip comes in contact with. There are two very important ways that this can be an advantage during a potentially dangerous situation. One: it can function as a tool to produce psychological intimidation on a would-be attacker. The sight and sound of a stun gun is a warning to any attacker that there is a high possibility that he/she can get hurt. This can discourage them from advancing any further. Two: in case the person does attack, the Runt can deliver a high output electric shock at close range, effectively causing involuntary muscular contraction and pain on the target site. The shock can also lead to temporary loss of muscle control, disorientation and even confusion. These reactions are enough to incapacitate an attacker for several minutes. The effects will wear away, but by then, you would already have run away or sought help. Have yet to really put this thing to the test but just testing for one second in the air it sounds very powerful.. I tested it on someone but they could only handle a couple of seconds and it left a mark through 3 layers of clothes. I hope not having to use it, but I field more safe. I purchased 3 runts for christmas presents for family members. I was very happy with the products and the family members greatly appreciated the gifts. My sister was approached while pumping gas in the evening and told me she wished she had had the runt with her because all she could do is yell for help and hope someone was willing to help. My daughter works in the city and has to take public trans and just clicking the runt has kept aggressive panhandlers from approaching. Great products and great support from the TBO-Tech team. They were especially helpful with follow up to meet the XMAS delivery date.